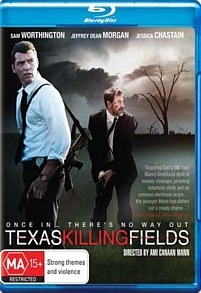 Texas Killing Fields Review. The best part of Texas Killing Fields was definitely Jeffrey Dean Morgan as Brian Heigh who definitely lent credibility to the story and of course the delightful and talented Chloe Grace Moretz. This crime thriller stars Sam Worthington (Detective Mike Souder) and Jeffrey Dean Morgan (Detective Brian Heigh) in this rather predictable film about a heinous serial killer with a rap sheet of over 60 victims. It's not a bad film per se but it's not the most original crime thriller either. Even so, it's still worth a gander if you're bored or a Worthington fan. The main protagonists of the film are Souder and Heigh, two detectives who become embroiled in the serial killers game as they are dragged over the border into Texas investigating his crimes in the wastelands surrounding the Gulf Coast refineries. Unfortunately this is not their jurisdiction which causes a problem. As they are drawn deeper into Texas, they are soon made known to the killer who begins to play a game of cluedo with them as he leaves a trail of evidence. And what better way to change his memorandum by involving these detectives! Regrettably for the locals, the killer kidnaps one of their own, a girl by the name Anne (Chloe Grace Moretz) who is used to lure the officers into his trap. With a rather predictable plot which goes through the motions, it still throws a few curve balls into the story, even though you're just itching to spoil the ending. The best part of Texas Killing Fields was definitely Jeffrey Dean Morgan as Brian Heigh who definitely lent credibility to the story and of course the delightful and talented Chloe Grace Moretz. All in all, it's a fun movie but don't expect anything that unique!